Save yourself some money and make your own acai bowls at home! 1. Throw the acai, banana (frozen if possible), frozen berries, coconut water, and the greens into a blender or food processor (I used a food processor since its better than my blender is). 2. Blend until everything is completely broken down. 3. 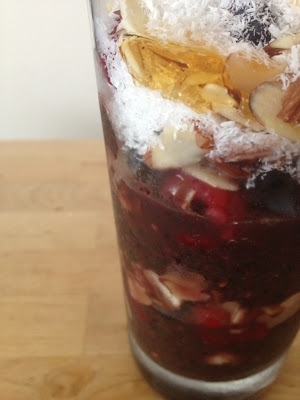 Alternate layers of your acai blend and your toppings (almonds, chia seeds, coconut, fresh fruit, and honey) in your parfait glass. I used all the toppings, but saved the coconut and honey just for the top layer. DELICIOUS.